A Hawk Enslaved has been sitting in my To Be Read pile for quite a while. I kept looking at it because I'd heard good things, yet I didn't open it. I'm not entirely sure why not. I think it may be because one of my favourite films is LadyHawke and I was worried it would ruin my memories - which is insane, because it wasn't LadyHawke at all. This is a story of Vikings, raiders, slaves, political intrigue and a man and woman in love and trying to make it work against all odds. It's beautifully written, with some gorgeous descriptions and phrasing. The sexual tension drips from the page, as well as suspense tension. And the hawking is an important but minor part of the story - no women are turned into hawks in this story. 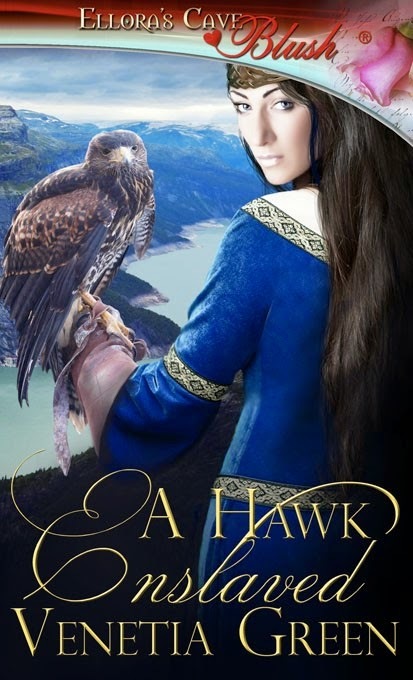 I thoroughly enjoyed Venetia Green's A Hawk Enslaved. I liked this too. 4 stars for me. I loved the first chapter... first half of the book just slightly better than the ending. Lady Hawke is a great movie. It's really no wonder we get along so well!